By using our Site, you are agreeing to the terms of this Policy and our Terms and Conditions of Use. When we update our Policy, we will notify you at our option either by placing a prominent notice on the home page of our Site or by sending you a notification directly. The effective date of this Policy is above. In order to provide you with our Site, we collect information that could be used, alone or in combination with other data, to identify you as an individual, known as personal information. Some of this personal information you provide directly to us, some is collected from third parties, and some we collect automatically through our Site. What personal information we collect depends on how you use our Site. Our Site includes forms on which you may choose to supply personal information that will enable you to make purchases or receive individualized services or features that we cannot offer to anonymous users. Personal information that you provide directly to us on those forms may include your name, physical address, e-mail address, and telephone number. When you make a purchase or request a service, we will additionally ask you for your contact and payment information for purposes of completing your order or request. Certain pages of our Site can be accessed only by registering as a user. In order to register, you will be required to set up a user account and complete a registration form, during which time we will ask for your e-mail address, password, first name, last name, address and qualifications. If you choose not to provide us with this information or set up a user account, you will not be able to take advantage of certain access-only features of our Site. We collect additional information about how you use and access our Site to analyze trends, administer our Site, track user navigation on the Site, and gather broad demographic information for aggregate use, which enables us to improve the Site by making it more accessible and easier to navigate. For example, we may automatically receive and record information in our server logs from your browser, including your IP address (the Internet address of your PC), your computer name, the type and version of your web browser, referrer addresses, and other generally accepted log information. IP addresses are not linked to personal information we have about you. We may also record page views (hit counts) and other general statistical and tracking information, which will be aggregated with that of other users in order to understand how our Site is being used. This information we collect is used to provide a more personalized experience for our Site users. You may be referred to our Site from another website or online communication. We may collect and use the information that is passed along by the web browser that references the web URL that linked us to you. We collect this information to understand the websites referring traffic to our Site and to present appropriate content to our potential users. We do not use this information to identify you. We may tabulate this data on an aggregate basis to identify trends and traffic patterns and share this aggregated data with our partners. You may voluntarily provide us with your personal information when communicating with us, such as when requesting information via e-mail, utilizing the Contact Us, PAR Report Card, or similar feedback features on the Site, or when otherwise contacting us electronically. Our Site may offer features that allow you to request and receive catalogs, electronic alerts or notices about updates to our Site, promotional announcements, new products, and other information. Our Site also includes forms that permit you to subscribe to newsletters or other subscriptions. When you sign up to receive catalogs, alerts, newsletters or other subscriptions we may collect your name, address, phone number, e-mail address, and other basic contact information. If you order products through our Site, we will collect personal information to process your orders, including your name, address, phone number, e-mail address, and shipping and other contact information for the recipient of the item (if other than you), your name and account number (if applicable), as well as payment information, such as a credit card number, billing address, expiration date, and other billing information. Certain forms on our Site may ask users to voluntarily provide a limited amount of demographic information, including your employment information, gender, date of birth, interests and hobbies. In addition, PAR, our agents, or our affiliates may conduct online surveys that ask you for your zip code, age, or your use of our services. PAR, our agents, or our affiliates may also contact you by e-mail using the e-mail address collected when you filled out one of the forms on our Site, with the option to participate in consumer research studies. Providing such demographic information and participating in such surveys or other consumer research is entirely voluntary. We aggregate the responses we receive before using that information to improve our services. We do not link your individual responses to your personal information at any time. PAR uses this information only for internal marketing research purposes to help us better serve our users and customers. Generally, PAR uses your information and other data collected about you to respond to user interests, needs, and preferences; to enhance our Site; to establish and maintain user accounts and deliver our services; to process orders and payments; to communicate with members about events, programs, new products, services, and offers; and to fulfill subscription or registration requests. We also use your information to analyze preferences, trends, and statistics to improve our Site and services. In doing so, we may use and share statistical or demographic information in the aggregate form that does not personally identify you with third parties in order to improve the Site for our users. PAR may also use your profile information to create personalized content, offers, and services, but this information will be used only by PAR and its agents or affiliates. If you opted to receive marketing, promotional, or other informational communications from or on behalf of PAR, we may use your e-mail address to occasionally contact you to announce new features, products, or services that may be available on our Site or to send news and information regarding PAR or its products or services. You can opt out of receiving these promotional communications at any time by following the instructions in the e-mail communication you receive. We may also use your e-mail address to contact you to verify and/or update any information related to services, features, or transactions that you have requested via our Site, as well as to notify you of new product releases and/or software updates. With the appropriate clearinghouses for purposes of processing authorized payments. With necessary third parties if required to protect PAR’s rights or property, or for purposes of a business deal (or negotiation of a business deal), involving the sale or transfer of all or any part of our business or assets. These deals can include any merger, financing acquisition, or bankruptcy transaction or proceeding. PAR employs technical and organizational controls to protect the personal information we collect and process about you, including use of encryption and secure connections when transmitting log-in, registration, and membership information. Through these controls, the personal information we collect and process on certain pages of our Site is encrypted when sent through the Internet and placed on our servers or the systems of the third party contracted to provide the service in question. You can verify that the connection is secure because you will see a key or a padlock (or other similar security symbol) at the bottom of your browser screen. Another identifier of a secure connection is the URL (or website address); the address will change from http://www.parinc.com/ to https://www.parinc.com/ or a similar page when a secure connection is in place. Finally, in the event that we utilize a third party to help us with our Site, our contract with the third party typically includes obligations on the third party to keep all information obtained during such contract confidential and secure and to use the information only to perform duties specified in our agreements with them. If you do not want to receive e-mail from us or to add or update certain personal information, you may contact us electronically via this form. Alternatively, you may write to us with your request at the following mailing address: PAR, Inc., 16204 N. Florida Ave., Lutz, Florida 33549. You may also request to review any personal information that we maintain about you by sending a written request to the same address, subject to our verification of your identity. We do not change our tracking processes in response to “Do Not Track” settings in your web browser. You may, however, disable certain tracking as discussed above (e.g., by disabling cookies). Our Site may contain links to other sites. 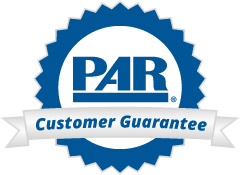 Please be aware that PAR is not responsible for the privacy policies or content of other sites. Other websites might use information differently than our policy permits. We strongly encourage you to review the privacy notices or policies of these other sites before providing any information.